This solo holiday to Scenic Lake Orta is not to be missed. 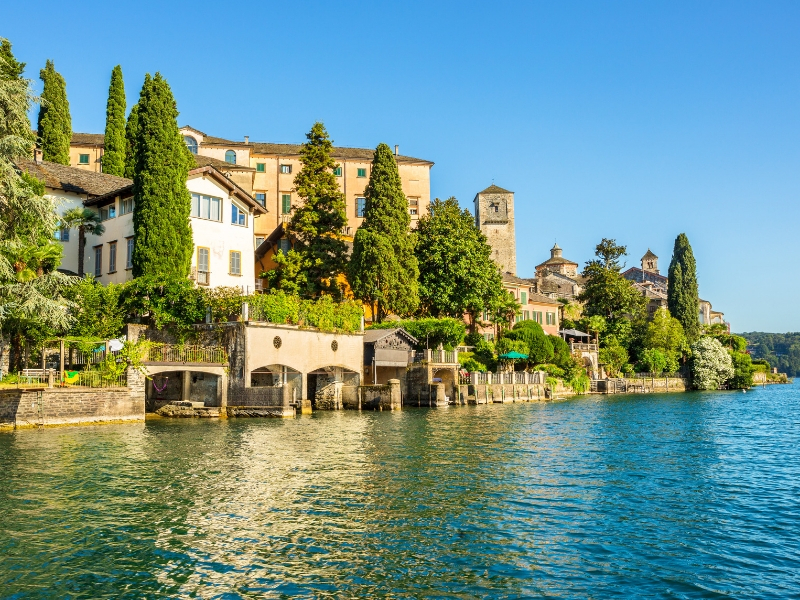 The smallest of the Italian Lakes, Orta remains refreshingly uncrowded and almost untouched by tourism. The rambling cobbled streets are lined with traditional trattorias and authentic, family-run hotels. In the lake’s centre, Isola San Giulio floats dreamily, adorned with handsome 18th-century buildings overlooked by the mountainous backdrop. Zip across the border into Switzerland by rail for yet more breathtaking scenery: glittering glaciers, classic mountain villages, and snow-capped chalets await. Titan’s VIP door-to-door travel service collects you from home, for your flight to Milan. We transfer to Hotel L’Approdo (4T) in Pettenasco, where we enjoy a welcome drink. A typical Piemontese dinner is included during your stay along with musical entertainment. A very long, yet worthwhile day today with some superbly scenic rail journeys into and around Switzerland. Our coach transfers us to Visp, from where we take the train to Zermatt, which lies at the foot of the Matterhorn. From here, we take the short walk to Gornergrat Bahn and join a further train (the Gornergrat mountain rack railway) to Gornergrat – a rocky ridge overlooking the Gorner Glacier (Switzerland’s second longest and most popular glacier). We arrive at the spectacular viewing platform in time for our included lunch before we take a train to Täsch. Enjoy an included dinner back at the hotel. You might like to join an optional full-day excursion to the busy Italian city of Milan – a centre for art, fashion and business – including a guided tour of The Cimitero Monumentale (‘Monumental Cemetery’), the Castello Sforzesco (Sforza Castle), la Scala Opera House and Theatrical Museum and entrance to Milan Cathedral (the Duomo).